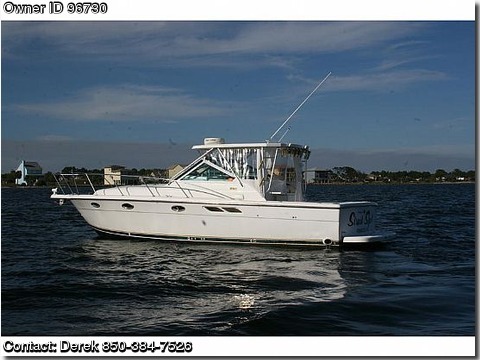 Please call boat owner Derek at 850-384-7526. This 31 LE Limited Edition is one of the best selling Tiara Yachts models. Built on the original 31 Tiara that was so popular, the new 31LE boats a reworked hull with prop pockets to allow for shallower draft, increased deadrise for a better head-sea ride. She has a 2 Cummins diesel engines, 1 engine is a 2003, and the other is a 2013 both have very low hours, all new 2013 canvas, new in cockpit AC, 2nd unit in cabin, new cushions & outside upholstry new 2013, a large cabin, double style cockpit with deck lift for engine compartment access, AM/FM stereo, auto helm, depthfinder, GPS, generator, halon, dockside power, head, shower, H&C water, galley, refigerator, stove, TV/DVD, 6 batteries, VHF, windlass, teak sole, fishbox, radar, rod holders, rocket launchers, livewell, documented, new 2014 bottom paint, and wide side decks for comfortable bow access. This boat has had numerous upgrades and shows extremely well for her age.